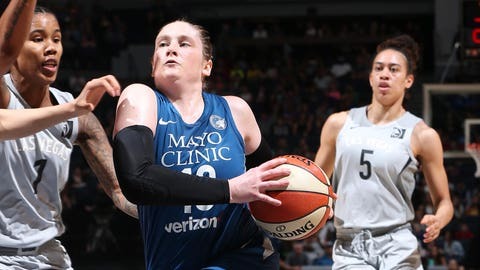 MINNEAPOLIS — Kayla McBride had 24 points, a career-high tying nine assists and seven rebounds to help the Las Vegas Aces beat the Minnesota Lynx 85-77 on Friday night for their fourth straight win. Tamera Young added 13 points and rookie A’ja Wilson, who was just 4-of-16 shooting, finished with 11 points, 15 rebounds, five assists and four blocks. Kelsey Plum and Carolyn Swords had 11 points apiece for Las Vegas (10-12). It was a season high for Swords, who also grabbed 11 rebounds, and Plum hit three 3-pointers. The Aces took control late in the first half with a 10-1 run, which was capped off by a Wilson jumper. Maya Moore hit a 3-pointer and then a step-back jumper to pull the Lynx (12-9) within four with 2 minutes to play but they would get no closer. Young answered with a jumper and, after Minnesota’s Lindsay Whalen hit floater in the lane, Wilson and Swords made back-to-back layups to cap the scoring. Whalen had a season-high 22 points, including three 3-pointers, with six rebounds and five assists, and Augustus finished with 14 points for Minnesota. Temi Fagbenle, who made her first career start, added a career-high tying 10 points.